I was already happy with my third-generation Apple TV, but when I read that Apple was expanding the support for accessibility in the fourth generation model I knew I was going to pre-order the device as soon as it became available. Today, my 4th-generation Apple TV finally arrived, and it does not disappoint with regard to its accessibility. This post is not an in-depth review of the new Apple TV (there are plenty of those online already including a really nice one from iMore), but rather my first impressions of the set top box as someone with a visual impairment and a personal interest in accessibility. I will also just focus on the built-in features of the new Apple TV, rather than the apps that can now be installed on the device (that will make for a separate post as I explore the App Store further in the next few weeks and even more apps become available). Nicely rounds out the support for accessibility across the Apple ecosystem by expanding on the support for VoiceOver in the previous model, adding Zoom and providing many of the same options for customizing the interface that are available on other Apple devices. Major accessibility features such as VoiceOver and Zoom are responsive and perform well, with little lag. The interface is cleaner and works better across the room: for example, it is now much easier for me to tell when an item has focus, something I struggle with on my third-generation Apple TV (especially on my smaller TV). Other than the new Siri remote there are no other options for controlling the new Apple TV, which does have an impact on accessibility for some users. I hope this situation is addressed soon through a software update. 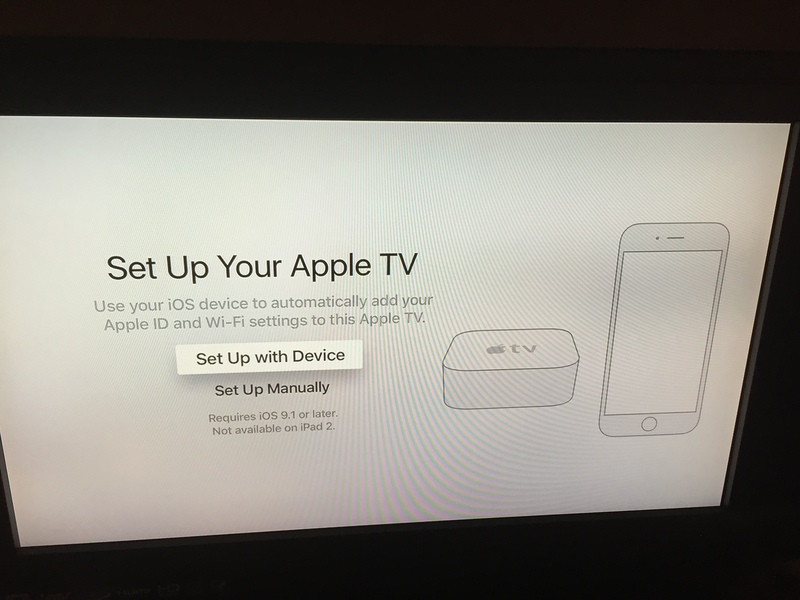 Setup for the new Apple TV couldn’t be easier. Once you have your power and HDMI cables connected and your new device has come on, you can triple-click the Menu button to turn on VoiceOver so that it can guide you through the rest of the setup. After you have selected your langauge and country/region, a brand new feature even allows you to place your iPhone (running iOS 9.1 or later) near the Apple TV to provide it with your network and Apple ID information. The rest of the setup goes as expected, with selections for enabling location services and Siri, sending diagnostics data to Apple and developers, agreeing to the terms of service no one reads and so on. Once the setup is complete, you will notice that the new interface is much brighter than the old one, with light gray backgrounds rather than black throughout. Some people have complained about this, and I can see where it can be a problem if you have an Apple TV in your bedroom and want to use it while the other person (roommate or significant other) is trying to sleep. It would be nice to have the option of a dark theme like Invert Colors on iOS devices for those who prefer it. Overall, I found the interface to be much easier for me to use. The item that has the focus pops out a bit, which is a more pronounced focus indidcator from in the older interface. Whether on the apps grid or in the menus I found this change made it easier for me to quickly know what item I had selected. The interface supports greater customization than on any previous Apple TV, thanks to an entire section labeled Interface in the Settings. When you go into Settings, the first thing you will notice is that the Accessibility options are now near the top of the General pane. In fact, they are one of the first things you see, right after the optons for the screenreader. On the previous Apple TV model, you had to scroll quite a bit to locate Accessibility toward the bottom of the General pane. Of course, you can still use the Accessibility shortcut to quickly enable and disable accessibility features without going into Settings. 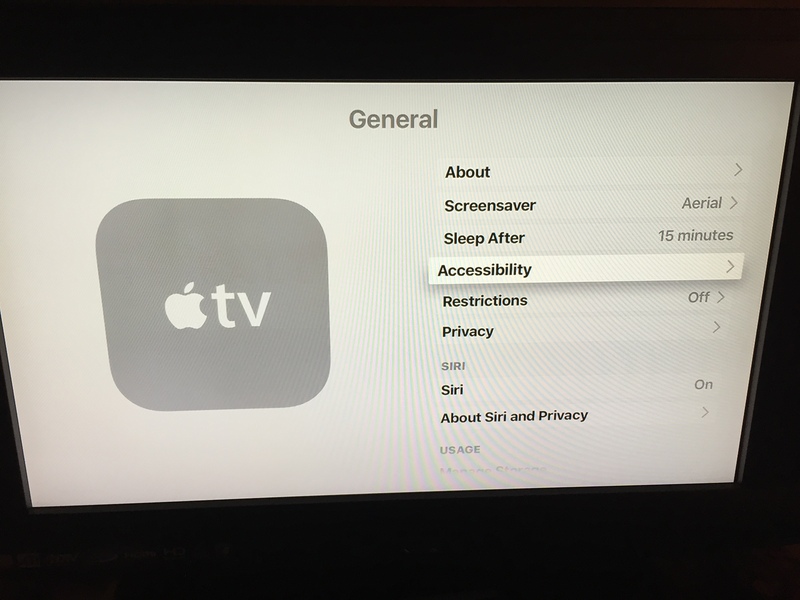 Whereas on the old Apple TV you invoked this Accessibility Shortcut (it was actually called the Accessibility Menu) by pressing and holding the Menu button, on the new one you do it by triple-clicking that same button (much like you triple-click the Home button on iOS devices to do the same thing). A nice touch is that VoiceOver will read the options shown by the Accessibility Shortcut even if you have it disabled in Settings. Bold Text: a simple toggle that provides more weight to the text labels. Enabling this feature will require a quick restart just as it does on other Apple devices. Increase Contrast: there are two options. The first reduces the transparency, while the second one changes the focus style by adding a thick outline around the currently selected item. Reduce Motion: another toggle that removes animations throughout the interface for those who are sensitive to the extra motion. Along with adjusting the appearance of the interface, the new Apple TV has retained the options for customizing closed captions that were available before. These are found in the Media section of the Accessibility pane, where you can also enable audio descriptions for programs that include them. In addition to turning on the captions, you can still customize the style by selecting Large Text and Classic options or creating your own style with many options for both the text and the background. Updated 11/5/15: Siri is one of the major selling points of the new Apple TV and I’ve finally had a chance to play around with it as I have started to interact with content on the device. Apple TV’s Siri allows you to do a number of things using speech: search for movies (“show me movies with Penelope Cruz”), refine your search (“only her dramas from 2012”), navigate (“open Photos” or my favorite – “home screen”), and control playback (“pause this,” “skip forward 30 seconds,” etc.) From an accessibility perspective, it allows you to enable/disable VoiceOver, “Turn on closed captions” while you are watching content, and if you miss something you can just say “What did he/she say?” and the playback will rewind 15 seconds and temporarily turn n the captions. I love this feature because it highlights the usefulness of captions not just as an accessibility feature but as an example of design that benefits everyone (universal design). My only concern with Siri is that you have to hold down the button the entire time you are speaking your request. That could be an issue for some people with motor difficulties, especially as you start to use Siri all the time. I am hoping that eventually there is an always on feature like “hey Siri” on the iPhone. drag one finger over the touchpad to pan in any direction. As you pan, an overlay will let you give you an idea of what area of the interface you are zoomed in on (very similar to the indicator you get with Apple Watch when you use the Digital Crown to zoom by row). stop panning by tapping the touchpad with two fingers. At that point, you will be able to use the usual flicking gestures to move from one item to the next without panning, but you can resume panning at any time with a second two-finger tap on the touchpad. adjust the zoom level by double-tapping with two fingers, holding, and then swiping up or down with the two fingers without letting go. The maximum amount you can zoom will be determined by the value selected in Settings. Update 11/5/15: In a previous version of this post I noted that I could get the labels read aloud each time I double-clicked the Siri button. The next day, I could not get my Apple TV to do it again and couldn’t figure out why. It turns out that this is a feature of Zoom. If Zoom is enabled, you can double-click the Siri button to hear an item read aloud. VoiceOver was already available on the older model, but the touchpad allows it to be an even more robust solution on the new one. 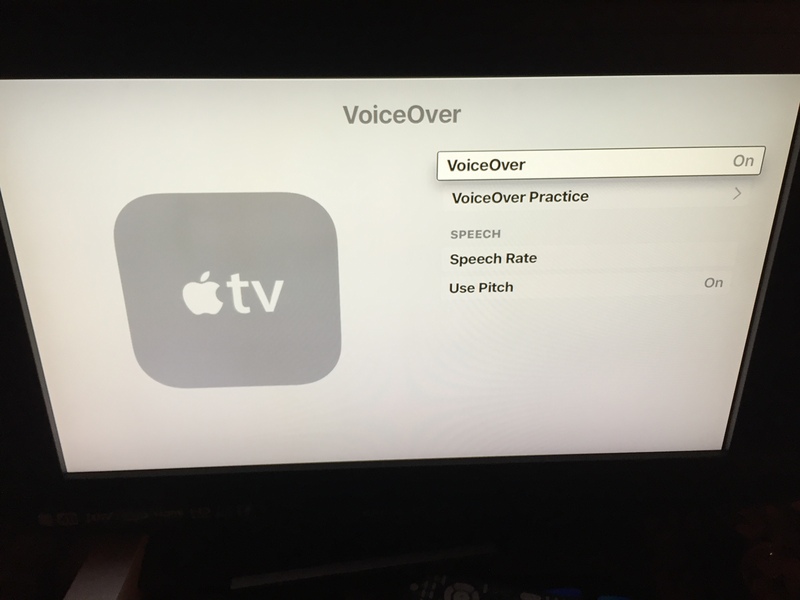 If you have used VoiceOver on an iOS device (or on a Mac laptop) you will already be somewhat familiar with how to interact with VoiceOver on the new Apple TV. However, if you do need some help, just know that you now have a VoiceOver Practice that is only shown when you have VoiceOver turned on (sound familiar, iOS users?). Move your finger around on the touchpad: move the focus to have VoiceOver speak the currently selected item aloud. Flick in any direction with one finger: move the focus in a given direction. Click on the touchpad: make a selection. Flick down with two fingers: read from the current location to the bottom. Flick up with two fingers: start reading from the top of the screen. Again, these gestures should be familiar if you have used an iOS device or a Mac laptop with the Trackpad Commander turned on. Speaking of the Trackpad Commander, the rotor is also supported and, you guessed it, you turn the virtual dial clockwise or counter-clockwise with two fingers to select a rotor option and then flick up or down with one finger to adjust its value. The rotor can be used to adjust the speech rate with more control (as opposed to the option in Settings that only allows you to select from a few preset values such as “Very Slow” or “Very Fast”). It also allows you hear items read by character or word, to enable or disable Direct Touch (where instead of flicking to navigate in a linear way you can just move your finger on the touchpad to move around the interface with more freedom) and more (I’m still trying to figure out a few of the options such as Navigate and Explore). You can use Siri to turn on VoiceOver (just say “Turn VoiceOver on”) but for some reason you can’t do the same for Zoom and other settings. When I tried it all it did was open the Settings, but it didn’t take me to Zoom or turn on the feature as requested. Overall, I like the new Apple TV from my limited exposure to it in the few hours since it arrived at my home. I like the updated interface, which is more cleanly laid out and designed for better visibility from across the room. From an accessibility perspective, I think Apple TV is the best game in town. None of the other set top boxes I have tried have the accessibility support Apple TV had even before the new model came out. The new model ups the ante with more options for customizing the appearance of the interface, the addition of Zoom for those who have low vision, and an enhanced VoiceOver that is more than ready for use with apps (though how well that works will depend as always on how well developers incorporate accessibility support in their apps). Performance is a lot better too. I almost forgot just how much time I spent waiting on my older Apple TV until I switched back to compare some of the features. The new model is a lot more responsive and just performs better all around. No Podcasts app: The company that basically brought us the podcast has launched a set top box without a dedicated podcast app (and as I write this, there are no Apple TV versions of Downcast or Overcast in the App Store). Aside from renting movies, podcasts are the next thing i consume the most on Apple TV. I can set them to play in the background while I do other things around the house, and I have a number of favorites I listen to on a regular basis. I’m hoping Apple is just taking a little bit more time to make sure the podcast app is done right when it is finally released. No Remote app support: the current Remote app for iOS is not compatible with the new Apple TV. This means that someone with a motor difficulty is not able to use Switch Control on an iOS device to navigate the Apple TV interface through the Remote app. While the built in accessibility features of the new Apple TV do an excellent job of accommodating the needs of those with vision and hearing difficulties, it is important to address this omission to make sure switch users can enjoy the Apple TV along with the rest of us. No support for external Bluetooth keyboards: Probably my biggest annoyance was having to go back to typing in user names and passwords with the onscreen keyboard. I have always used either the Remote app for iOS or an external keyboard connected over Bluetooth for this purpose, but both options are not possible at launch. Especially when entering complicated passwords, doing it on an external keyboaard is much faster and easier. The remote: I generally like the new remote. It is lightweight and feels good in the hand. My issue is that I know there is good likelihood that I will lose the thing and it will cost me $79 to replace it (the previous remote was only $19 for comparison). I’m thinking I may buy a $25 tile and find a way to attach it to the remote just in case. I’m surprised Apple did not build the same Ping feature that is available between the Apple Watch and the iPhone, allowing us to quickly find a misplaced remote by emitting a loud ping sound. For now Tile may be my best bet ($25 is much better than $79). In the meantime, I have set up my existing TV remote to work with the Apple TV. Most of these issues are easily fixable with a software update and as I went to publish this post I read that Apple had released a beta of tvOS 9.1, the first update for the new Apple TV. It is unclear whether this update will bring back some of the features listed above, or if it is just a bug fix release. Time will tell. Are you planning to buy an Apple TV? If you already have it, what do you like about it? What do you think can be improved? 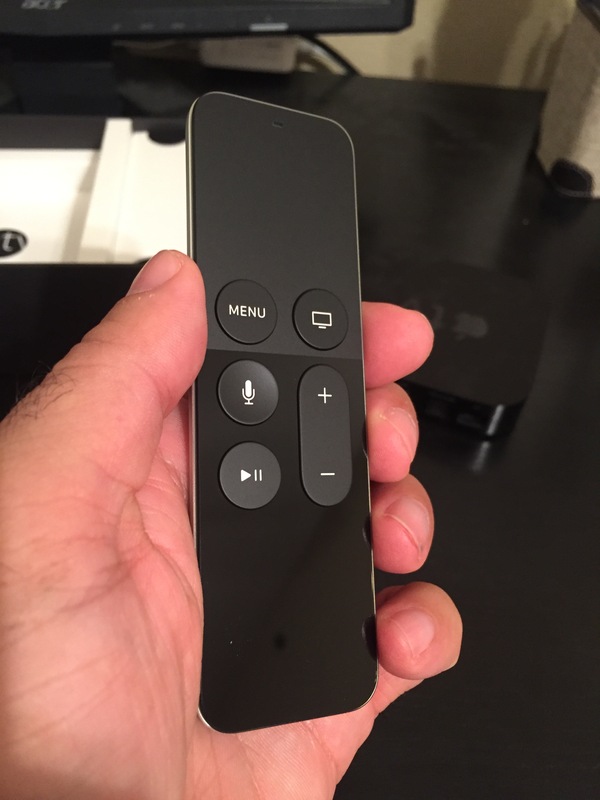 The Apple remote app supports Apple TV fourth-generation as of version 4.2.3, released on 9 December 2015, five weeks after this post was originally published. It is a shame that this update wasn’t available when Apple TV fourth-generation was released, but at least they have fixed this now. We have only just set up our new Apple TV, and I have noticed that the remote app tents to skip over items when swiping. I hope there is a way to fix this. Also, I have not managed to get either the rotor or touch navigation to work on the siri remote. I’m hoping this is just a matter of learning how to use it properly. I agree that support for the Remote app should have been included from the start. In an upcoming tvOS update (now in beta) it will finally also include support for a Bluetooth keyboard. As for your question about the sensitivity of the swipes on the remote app, Apple TV does have a setting for touch sensitivity that may help. I am like you sometimes frustrated when using the remote app and it skips over a choice. Hello. We have a 4th generation apple tv and we installed the sling app so we wouldn’t have to use direct tv. Hav any of you guys used this app with the remote app for the IPhone? My wife, who is sighted, suggested that I get the remote app for the phone and then pair it as she said that the remote itself was a pain, even for her. I am having a difficult time navitaging around the gesture area, moving to shows and categories and getting things to play. I wonder if it’s just a mater of sling not being fully accessible or perhaps I’m missing some steps with the remote app? Thanks for the help. I am not familiar with the Sling app, so I can’t comment on its accessibility for VoiceOver. I rarely use the remote that came with my 4th gen Apple TV: part of the reason is that it is small and I can never find it when I need it. I am also afraid that I will break it. What I did was set up my existing TV remote to work with the Apple TV and then I also use my iPhone as a remote sometimes. You do lose something with these approaches, namely the ability to use Siri (but I found I wasn’t using that so much anyway). The upcoming remote app is supposed to add more functionality and I can’t wait for that. Now do note that the gesture area on the remote app is not going to provide feedback even if you have VoiceOver enabled on your iPhone, for that you need to enable Voiceover on the Apple TV so that it gives you information about the item selected on your TV. I hope that is helpful to you, and enjoy your Apple TV.